Venomous snake aside, the remaining 33 species and subspecies of snake are usually very harmless to humans. If you don’t handle them, leaving them to do their own thing, they’ll leave you alone. If you try to handle them, corner them, or capture them, there’s a good chance they’ll strike back. When you consider that there are non-venomous snakes that look exactly like venomous ones, and it’s not always easy to tell the difference between the two in a split second, it’s for the best that you leave them to slither off into the sunset. 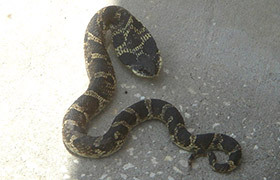 Many of the snakes you’ll find in South Carolina are similar to those found in other, neighboring states. 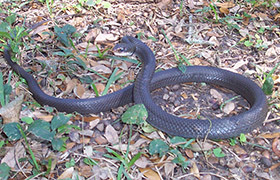 Black Racer: One of the most commonly sighted snakes in South Carolina, the black racer is pretty much as the name suggests - a long, slender and black (or dark colored) snake that grows to about 70 inches. It also goes by a bunch of other names including the black runner, or even the blur runner / racer. You may find this snake in your back yard looking a little bit like a twig. This is a defense mechanism. It places its body in a ‘kink’ position to look like a twig so predators will just leave it alone. Rat Snakes: You'll find a couple of rat snake species in South Carolina - Black Rat and Yellow Rat (pictured to the left) snakes to be more specific. You’ll also find a cousin of the rat snake - the Corn Snake. The latter is often kept as household pets and are one of the most docile snake breeds you can find. 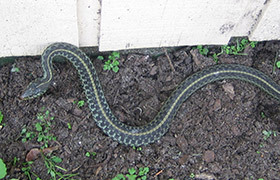 Eastern Garter: The garter snake looks like a garter strap and the eastern garter snake is no exception with solid pale stripes running down a darker brown, grey or olive body. A medium-sized snake that grows to about 25 inches maximum, they’ll eat pretty much anything they can fit in their mouth making them very adaptable. If they had a preference, they’d choose worms, slugs, toads and frogs. Scarlet Snake: Similar to the scarlet king snake, the scarlet snake has mimicked the red, black and yellow warning markings of the coral snake to help keep safe from predators. Growing to a maximum of about 25 inches, you probably won’t spot a scarlet snake seeing as they’re nocturnal, although if you head to moist woods and forests and look under fallen tree logs or leaf litter, you might just see the bright markings of one. Eastern Hognose Snake: A name earned from the upturned nose to aid with digging around in moist sands and soils for creatures such as frogs and toads, both the eastern and Southern Hognose Snake are common snakes of South Carolina. Only growing to around thirty inches, it might display intimidating behavior when threatened but is actually harmless and contains no venom. Next on the list is the humble brown snake, a snake that is very much a dirty or sluggish brown color. The belly is usually a touch lighter - an off-white or cream color, and you may occasionally find patches or diamond-shaped formations running along the length. If you have piles of garbage, litter or garden debris in your back yard, a brown snake might just be hiding beneath it. They love to eat the bugs that thrive in your back yard - snails, slugs and earthworms. 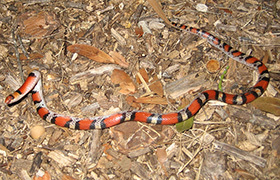 Also coming under the same ‘brown snake’ species, you’ll find the Florida Redbelly and Northern Redbelly snakes in South Carolina but less commonly. The eastern king snake is a relatively popular and common snake among most of the United States but there are two other king snakes you’ll find in South Carolina - Mole King Snake and Scarlet King Snake. With their bright red, yellow, black and white markings, you’d think they were venomous snakes but they're not. They’re just mimicking the coral snake’s markings to ward off predators. As the name suggests, this snake is a green snake, normally quite bright in color (although shades do vary), well camouflaged for grassy areas which is where you’ll commonly find it. It’s a very thin snake but can grow to be quite long, as much as 45 inches, it’s an insect-eating snake that doesn’t constrict. The name often tells you how they look although, like many other snakes, they can come in a wide and diverse range of colors and pattern formations. 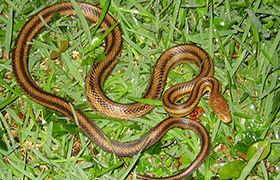 A snake that seems to be popular in many places across the USA including Ohio and Virginia, the eastern smooth earth snake is a small snake, only about 10-13 inches long, and can often be found in residential back gardens because of their love for earthworms, beetles and other bugs, all of which are easily spotted in the average flower patch.